The Alabama Hills, near Lone Pine in the Eastern Sierra, have long been one of my favorite places on earth; situated at the base of California’s Mt. Whitney, and only about 80 miles as the crow flies from Death Valley’s Badwater, it's a photographic paradise. The area is BLM land, and you can camp pretty much anywhere. This particular location was one of my favorite spots and usually the spot I elected to set up camp. 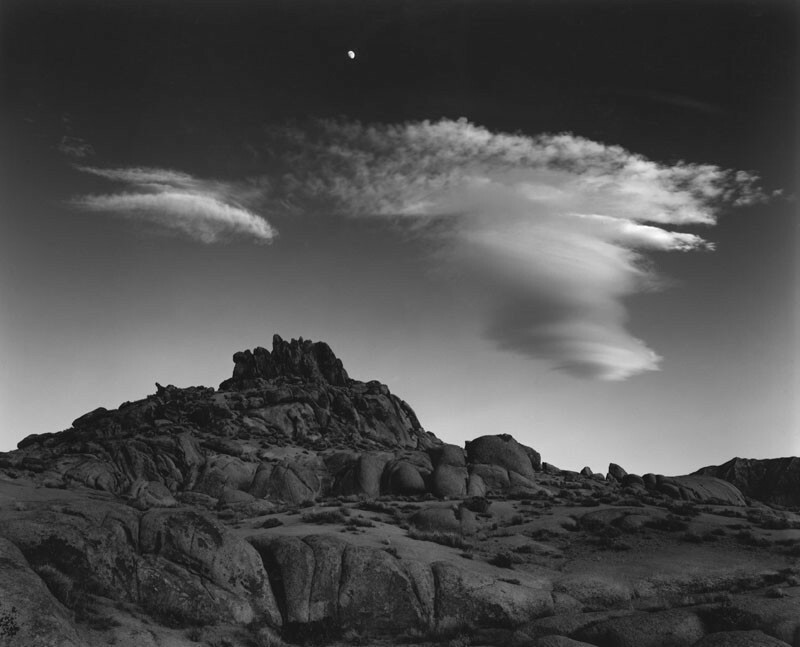 During one visit, the lenticular clouds sat there in the sky for hours, with the moon gradually rising behind them. I got the 8x10 camera out and photographed the scene in in black and white. A bit later, I decided to do it with color negative film, as well. A wonderful evening! I started out liking the color photograph best, but a few years later, I had cause to print the BW version for a client and set the color version aside, having found a deeper love for the black-and-white.